I thought I’d write about one of the pieces you may have seen in my gallery on here, Merlin, or The Hermit. He is the first full body doll I’ve made and stands at about a foot tall and is entirely needle felted. He was inspired by the Hermit from the tarot deck. Rather than being simply one who hides away as he is often seen, the Hermit is the sage who stands on the mountain top with the lamp of enlightenment on his staff, showing the way for others. He is Yod, the open hand, giving people the opportunity to find knowledge. He is also Virgo, and, this being my sun sign, I feel a strong affinity to him, which is why I chose to make him as my first doll. Wow! I LOVE this!! 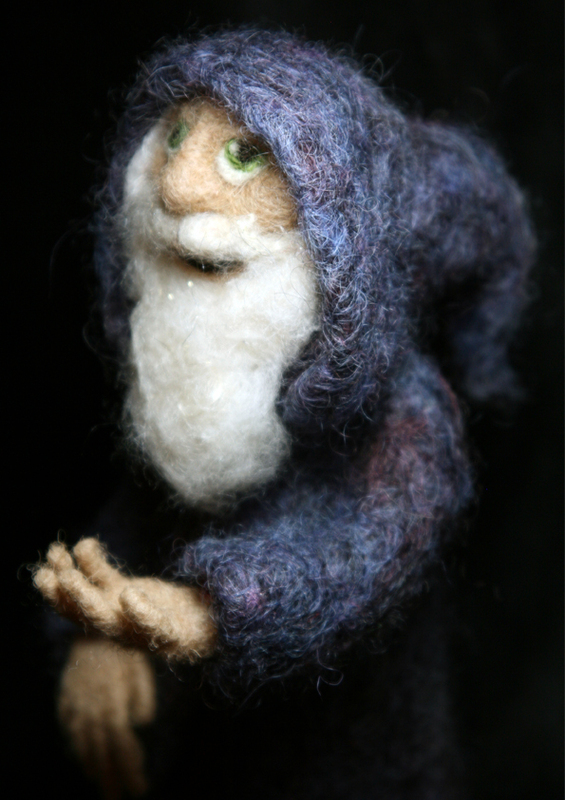 I’ve done a little bit of needle felting, but nothing as cool as this. You have inspired me! I’m so pleased to have found your blog. Looking forward to seeing more of your projects.